HELENA — It’s a new year with a new legislative session around the corner, but an old rift has re-emerged among Montana’s Republican lawmakers. The split first surfaced around a decade ago, when a small group of Republican lawmakers began working with minority Democrats to pass legislation, raising ire among other GOP party members. The party seemed to be on the mend during the 2017 session, but the reopening of the old wound became apparent in November 2018 as GOP factions vied for leadership positions. It showed itself again in December when the House Rules Committee met to debate amendments that would change the way representatives are assigned to committees, and the way the full House can bring bills stagnating in those committees to the floor for debate. Currently, the House speaker makes committee assignments. Blast motions required a 60-vote supermajority. Last month’s proposed amendments would model those processes after norms in the state Senate, where senators approve committee assignment and re-referral of bills and need only a simple majority, or 51 votes, to move bills out of committee. Republicans will occupy 58 House seats in the 2019 session. Democrats will occupy 42. A group of moderate GOP members who occasionally works with Democrats supports the changes. GOP leadership in the House, however, does not. The House Rules Committee adjourned last month without discussing the amendments. The issue will be taken up again once lawmakers gavel in the 2019 session. In the meantime, some Republican lawmakers have been rallying opposition to the changes. Tschida’s letter accused those minority GOP members of trying to “bend the rules” and gain “control behind the scenes” by working with Democratic Gov. Steve Bullock to expand Medicaid, implement a pre-kindergarten program, and increase taxes. Switching the blast motion requirement from 60 votes to 51 votes allows the smaller Republican caucus to team up with Democrats and undermine the GOP majority, Tschida argued. “The will of Montanans is 58 Republican votes, not 51,” he wrote. Some central committees responded to Tschida’s call to action. The Cascade County Republican Central Committee sent an email aimed at local Republicans calling out a group of “RINOS,” or “Republicans in name only,” for attempting to cede GOP control to minority Democrats. “Think of the consequences if you do nothing,” the email implored. It then claimed that 14 GOP representatives intend to support the rules change and listed the lawmakers’ contact information. Cascade County Republican Central Committee Chair Sheridan Buck did not respond to multiple requests for comment. 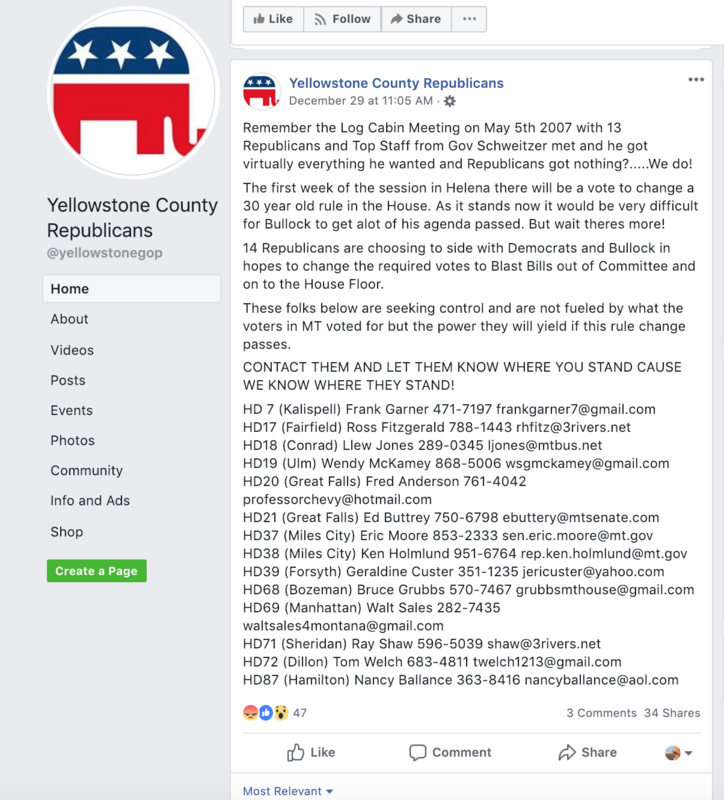 The Yellowstone County Republicans Facebook page posted a similar critique of the same 14 lawmakers on Dec. 29. Among the lawmakers named by the central committees is Rep. Nancy Ballance, R-Hamilton. Ballance chaired the powerful House Appropriations Committee the past two sessions and will share that role with Rep. Carl Glimm, R-Kila, this time around. The spat follows a relatively peaceful 2017 session in which Republican lawmakers seemed to settle a feud that first emerged around 2007. RELATED: AFTER A DECADE-LONG INTERNAL BATTLE, HAVE LEGISLATIVE REPUBLICANS BURIED THE HATCHET? “It was a little better in ’17, because there was not a lot of money to fight over in the House,” Tschida said. But 2019 could prove far more contentious for the two Republican factions. “What can we work on together? Because essentially, the group … that’s more constitutionally conservative, we don’t have anything to offer. We’re just saying let’s follow the espoused goals and objectives of the party platform,” Tschida said. When a central plank of the state’s GOP platform is reducing taxes, it’s hard to compromise on issues like Medicaid expansion or a pre-K program. Those bills inevitably include a fiscal note, Tschida said, and the money has to come from somewhere. “The reason I don’t think the small group of 13 or 14 members [are] willing to work with their Republican counterparts is because they’ve already struck deals with the other side,” Tschida said. Ballance, however, is adamant that the 14 Republican lawmakers named in central committee emails have not struck any backroom deals regarding the House rules change. The House rules fight could set the stage for a longer battle among Republican lawmakers during the 2019 session. Montana’s House of Representatives in 1989 voted to change the blast motion requirement from a 51-vote simple majority to a 60-vote supermajority. In the decades since, Ballance said, both Democrats and Republicans have used the rule to make backroom deals and prevent bills from being debated on the floor. “Everybody needs to have an equal opportunity to have their bill heard,” Ballance said. Rep. Geraldine Custer, R-Forsyth, said she thinks bills she has supported have been sent to “kill committees” for being too moderate. “We all represent the same number of people. I still represent the Democrats in my district just as I do the Republicans. Their livelihoods matter just as much,” she said. Custer was also called out in emails as a Republican likely to support the House rules change. She said she takes issue with leadership trying to put public pressure on moderate Republicans like her to toe the party line instead of trying to find a compromise on the rules issue. “You try to unify your party. You don’t try to make it disintegrate,” Custer said. More than changing the blast motion requirement, Custer said she wants House lawmakers to have a say in committee assignments, which would remove some of the speaker’s authority. “The speaker has had all the power to decide what bill goes to what committee, and can send it to a committee stacked with people he knows will kill it,” Custer said. In other cases, Ballance said, the speaker can choose not to assign a bill to committee, or assign it too late, effectively killing it. That’s what happened in 2017 when then-Speaker Austin Knudsen refused to schedule a floor vote on a bill that would have allowed counties to hold an all-mail ballot in a special congressional election in May of that year. Tschida, however, said bills tend to flounder in committees simply because they’re not effective legislation. “I have no interest in becoming a party boss and exerting influence,” he said. Reaching out to the central committees, Tschida said, can effectively apply grassroots pressure on lawmakers to follow their party’s platform.